Then, my wedding ring got pooped on. Then my earrings got mashed sweet potatoes smashed into them. Then my baby turned into a toddler. Scared, I still only wear my wedding ring at home. Oh, it was the worst thing! I changed a super diaper blowout, washed and scrubbed my hands and still could smell poop. It was driving me crazy. Then I saw it jammed in the stone setting of my wedding ring. Then there were the (many) times I would pick up a very messy Ollie from his highchair, and have sweet potatoes or avocado smashed into my earrings while he'd try to rip them out. Once the blowouts ceased to exist, last month when Ollie became fully potty trained, I started wearing my jewelry more regularly. But, I still can't help but freak-out about keeping everything clean. The amount of crap, crud and scary bacteria that gets stuck, and grows, in the tiny cracks and crevasses of jewelry, are deadly! So, when the opportunity presented itself to test out the AquaSonic Wave Jewelry cleaner, I was all for it. The little contraption looked GENIUS! 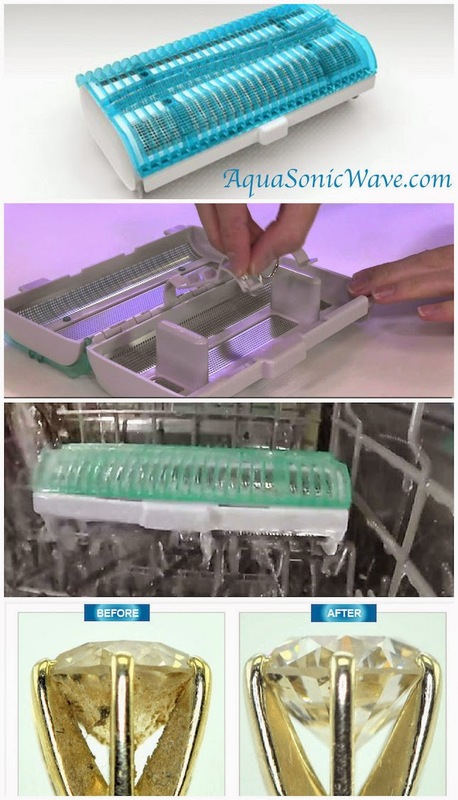 The AquaSonic Wave, is a jewelry cleaner you pop, full of your jewelry, in the dishwasher! Yes, the dishwasher. So you can stick all kinds of jewelry in at once, toss AquaSonic wave in with the dinner dishes, and boom, ALL of your jewelry is clean! Of course, I started thinking of all kinds of small pieces and parts of Ollie's toys and drinking cup lids that I want jam in the AquaSonic Wave too. Pretty cool, right? The mesh outer cover keeps even the smallest of gems from escaping. Plus, the steal mesh also keeps the jewelry safe while in the wash cycle. You can even run a sanitizing cycle! I was floored by how clean and nice everything looked. I will never soak then scrub ring by ring again!